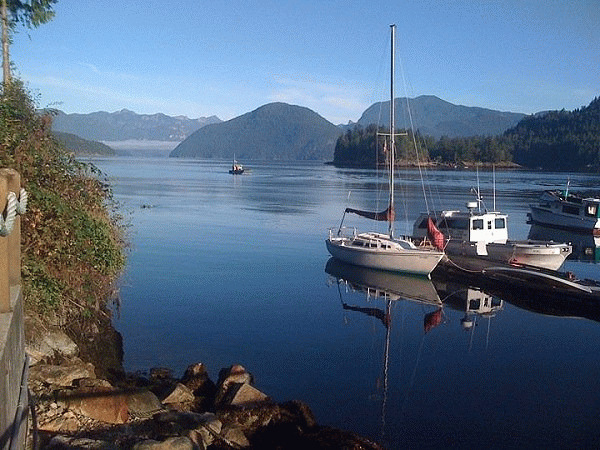 With 600 feet of remote waterfront on the Sechelt Inlet in Egmont, the Backeddy Resort and Marina is a water lover's playground! Stay for a night or a week and breathe in the fresh ocean air while exploring a world away. We have cozy cabins, comfortable rooms in our inn, picturesque campsites and superb RV sites just waiting for you. Whatever your preference, you'll love it here! Our beautiful cedar built A-frame cabins have wood burning stoves, kitchenettes, lofts and comfortable beds. Four can sleep comfortably in each of the cabins nestled in our cabin village. Relax in the warmth of a bonfire in the evenings in the village centre. Roast marshmallows with the kids and listen to the waves on the shore. And, in the morning after a restful night's sleep, sit on your own porch overlooking the water with a fresh-brewed cup of coffee. 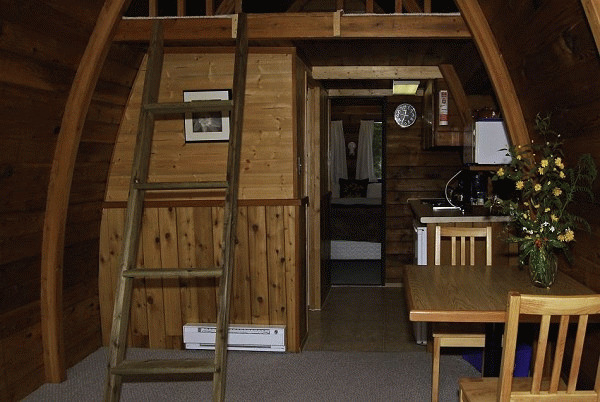 Our nine A-frame timber cabins overlook the beauty and tranquility of the Sechelt Inlet. While each cabin is unique they all feature a kitchenette with propane stove, simple bathrooms, and ocean view decks. Some cabins have wood burning fireplaces and additional sleeping lofts. Our four single and two double inn rooms provide a simple west-coast comfort that you'll notice right away. All rooms have bathrooms with showers, bar fridges, coffee makers and a sitting area. Our beautiful water view rooms face the Sechelt Inlet while our garden rooms surround you with a view compliments of Mother Nature herself. Located at the water's edge, our seven site RV park has one of the most breathtaking views of Sechelt Inlet in Egmont. Each site has a 15 amp power hookup and there is a community water station on the way to the public wash house with showers and laundry facilities. An additional seven tent sites are nestled on a lush grassy bench of land overlooking the pub and marina. Please visit Backeddy Resort & Marina Website.